Now, please tell me if you’ve heard this excuse before. UFC lightweight Nate Diaz (pictured) says he won’t be able to meet Gray Maynard at “The Ultimate Fighter 18 Finale” because of a prior engagement … his 10-year high school reunion. No, you read that correctly. 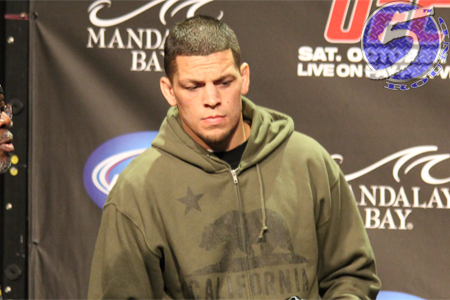 “@ufc Cant make it november 30th ive gotta high school reuinion i have to tend too…” Diaz tweeted Monday evening. Diaz, now 28 years old, attended Tokay High School in Lodi, California. While there’s no official report of whether Diaz actually graduated with a diploma, it is presumed he did. However, older brother Nick Diaz dropped out of the same school after his freshman year. When the UFC first announced the matchup, it is assumed Diaz signed a bout agreement accepting the fight. I’m curious why the scheduling conflict wasn’t brought up then. Diaz has dropped two straight scraps, with his most recent setback coming via TKO to Josh Thomson in April. Given Diaz’s aggressive game and popularity, it’s unlikely he’d fighting for his UFC life. Although, today’s announcement could have him skating on thinner ice. TUF 18 Finale takes place November 30 inside Mandalay Bay Events Center in Las Vegas, Nevada.